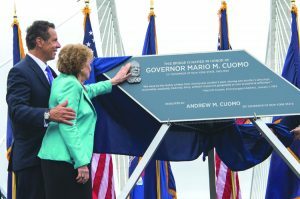 TARRYTOWN – Governor Andrew M. Cuomo Friday announced the grand opening of the eastbound span of the new Governor Mario M. Cuomo Bridge, an iconic twin-span cable-stayed crossing linking Westchester and Rockland counties. The $3.98 billion project to construct the 3.1-mile bridge — the first cable-stayed bridge across the Hudson River — and its ancillary facilities is one of the largest in the United States and the biggest in the history of the New York State Thruway Authority. 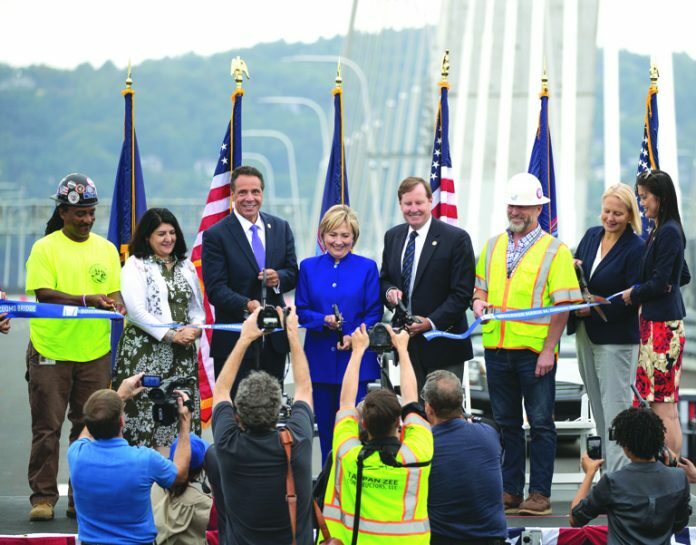 Operations to shift four lanes of Westchester-bound traffic to the new span were to start on Friday night, with the first cars crossing early Saturday, but have been delayed due to safety concerns. The Governor celebrated the opening on the new bridge with hundreds of dignitaries and community members from the Hudson Valley and across the state, workers who built the new bridge, high school students from Irvington and Nyack, Nyack High School’s Red Storm Marching Band and singer-songwriter and Rockland County native Grace VanderWaal, who performed “The Star-Spangled Banner.” In addition to the unveiling of a commemorative plaque, the Governor also drove across the new bridge in a ceremonial first ride in President Franklin Delano Roosevelt’s 1932 Packard. 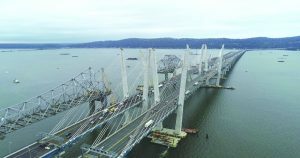 The Governor Mario M. Cuomo Bridge project replaces the retired 62-year-old Tappan Zee Bridge with two new state-of-the-art cable-stayed spans – one Rockland-bound and one Westchester-bound. The first, Rockland-bound span opened last year in a temporary traffic configuration comprised of four traffic lanes in each direction to allow design-builder Tappan Zee Constructors to complete construction of the second span in the footprint of the old bridge at its landings. The new bridge will serve more than 140,000 motorists each day. Following the shift, eastbound motorists will have access to four general traffic lanes and emergency shoulders, and a dedicated bus lane will open next month for eastbound traffic. The fully completed project will also include a bicycle and walking path. Rockland-bound motorists will continue to use their current four lanes on the westbound span. In the coming weeks, the four lanes of westbound traffic will be shifted to the opposite side of the span—where the eastbound traffic was previously—to allow for on-bridge construction of the bicycle/pedestrian path and its six overlooks. The Governor Mario M. Cuomo Bridge is the first cable-stayed bridge across the Hudson River. Featuring eight 419-foot towers standing at a five-degree angle, the twin-span bridge has a total of 192 stay cables that would stretch 14 miles if laid end-to-end. A cable-stayed bridge uses steel cables placed at an angle to connect the bridge deck to vertical towers that extend high above the roadway. Zee. Matilda assisted in the unveiling of the bridge named for the current governor’s father and her late husband. More than 220 million pounds of all-American steel was used to build the bridge. Approximately 7,000 workers have contributed to date and nearly 11.5 million work hours have been dedicated to the project. Designed to last 100 years without needing major maintenance, the Governor Mario M. Cuomo Bridge is one of the biggest active bridge projects in the nation and the largest in the history of the New York State Thruway Authority. The project has been recognized across the nation, including by former President Barack Obama, who put it at the top of his list of critical infrastructure priority projects. At Governor Cuomo’s direction, the New York State Thruway Authority has managed the bridge replacement project since 2013 with two fundamental objectives — first, to fully open the bridge to traffic in 2018, and second, finish the bridge at or below the budgeted cost of $3.98 billion.